Although tap water looks clean it actually contains a lot of dissolved chemicals and minerals. The Chilterns is a hard water area and so the chemical and mineral levels are very high. It is these minerals (mainly calcium and magnesium) that leave white residues on glass. The pure water system uses purification technology to de-mineralise and de-ionise tap water to remove these impurities and produce pure water. Because of the aggressive strength of pure water you do not need to use cleaning detergents on the windows which is much better for the environment. Most ‘traditional’ window cleaners use washing up liquid when cleaning. Washing up liquid is very toxic and can have long term negative effect on the environment. Because the impurities have been removed we do not need to squeegee the windows, we simply rinse the glass after brushing to leave an excellent streak free finish. Complies with health and safety legislation as we work from the safety of the ground, eliminating most needs for ladders and high access equipment. The pure water technology results in cleaner windows for longer! Does a Water Fed Pole system clean windows as well as traditional methods? The simple answer is yes! Water is a fantastic cleaning agent and combined with the gentle cleaning action of the soft brushes your windows will be cleaned to a sparkling finish. When the window cleaner leaves my windows are still wet, won’t that leave marks? When you wash glass with ordinary tap water and leave it to dry naturally you are often left with white streaky lines. The streaky marks are caused by impurities in the water, because Water Fed Pole systems use completely pure water there is nothing to leave streaks so your windows are left completely clean. Occasionally, on the first or second window clean with purified water, you can get a run down the window after we’ve left. The purified water used to clean the windows has probably got under a top window seal. Purified water is like a magnet to dirt and has come in contact with old dirt or old soap under the seal, attracted it, then run down the glass. Then the water dries and leaves only the impurities it picked up, thus you get a dirty stain or white soap stain on the glass. If this happens simply call me and I will come round and re-clean the window ASAP – for free of course. How does a Water Fed Pole system work? We use an extendable pole to reach all the windows on your property. Water is sprayed onto the windows and dirt is removed using the soft brush. The windows are then rinsed to remove all dirt. Why do window cleaners use the Water Fed Pole system? The primary reason window cleaners have moved to a pole system is safety. Window cleaning has long been one of the most dangerous professions in the UK with a number of deaths and serious injuries occurring each year. The Water fed Pole system allows window cleaners to work from the ground reducing the risk of serious injury. Not in every case. There are many variables which affect the end result. Previously you probably have had your windows cleaned using a solution liquid. It produces a great result immediately after finished cleaning but soon gets dirty afterwards. 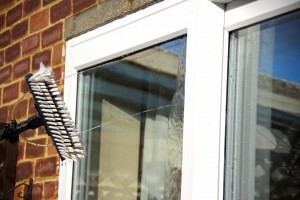 Liquid can leave deposits on the glass which attracts the dirt between cleans. After the first couple of cleans, you may notice one or two spots on the glass where we haven’t manage to totally remove the deposits. These will disappear after a few cleans. Please do not be concerned by this, it is only pure water which is even less harmful to your building than rainwater. Because this water dries without leaving streaks, it is unnecessary to squeegee the windows dry. This water will quickly evaporate without a trace. We normally do monthly cleans but can accommodate bi-monthly cleans also, this can be discussed with us when you have a quote. We pride ourselves on providing you with what you want – A regular and reliable window cleaning service. Will you still come if it’s raining? More often than not, yes we will. Our service maintains your windows all year round. The fact that it’s raining doesn’t alter the fact that there is still accumulated dirt on your windows and frames to remove. It’s because we continue to clean in all but the very worst weather that allows us to offer a regular and reliable service. Get in touch today via email to request more details.